Are you interested in having a Vitiligo Group in your City? Become a VITFriends AFFILIATE and start a group in your area and we will STAND and work with you. VITFriends serves as fiscal sponsor to any state vitiligo group desiring support! * Spread the word in your community about VITFriends as an ambassador/group leader. * Start a GROUP in your area, public FREE library ideal place. If you have an existing group, you will gain support and encouragement from an assigned MENTOR. * VITFriends will refer people to your state group. * Be assigned your own designated 800 extension. * The use of our conference line for YOUR meeting. * Share VITFriends information with individuals, families, Dermatology and Medical offices. * Official Volunteer Group Leadership role with the corporate body. * You MUST submit your BIO. * Leaders DUES of $125.00 and signed 2 year commitment letter. * Your conference registration waived with Seven or more delegates/FRIENDS attending the conference with you. * Host meetings/WALK/conference in your state/community. *Leaders/assigned mentor available 24/7 to answer question of be in your meeting via skype/facebook, etc. * Our administrative team will make plans to visit your meetings. * Distribute our Flyer, Brochures, and Postcard to individuals with Vitiligo, hospitals and clinics. * Review and Share our website. Also, share the things that are happening and photos on your page on the VITFriends site. * FOLLOW-us on: blogtalkradio.com and even HOST a Show for us. * Financially pledge and/or Solicit SUPPORT for our cause ANNUALLY. Donations you submit that is over $350.00 will waive your annual dues. * Prayerfully pledge to Support this cause. Your Annual DUES can be reported to your employer for the Matching Gift Program. VITFriends has been the example to me & paved the way and continues to mentor me as I lead our - &^%$#@%$ - Vitiligo Community! Not only has Vitfriends provided support through their media website, but a phone number and through the conference NETWORKING with other groups and medical professionals. The ENCOURAGEMENT IS WONDERFUL! The encouragement to keep going when locally the support isn't there or consistent! I have been able to have resources to call through Vitfriends as well as ideas to fundraise, reach out to make our local group known more! 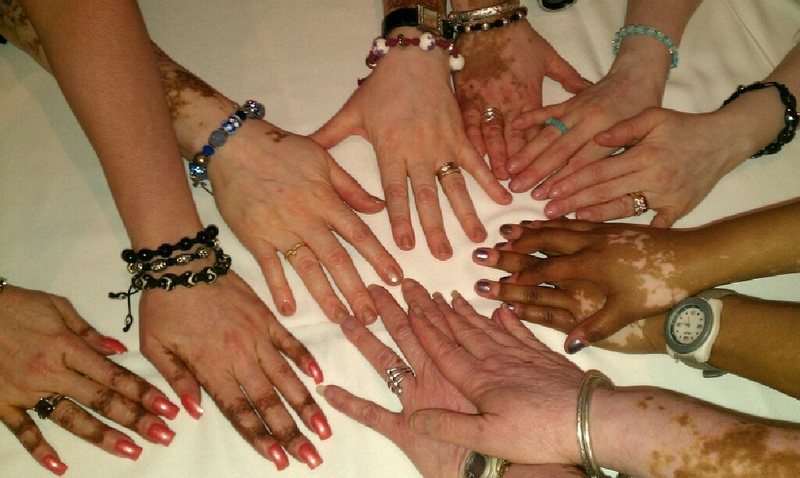 I know Vitfriends will continue to Mentor & Support & Encourage - &^%$#^&& - Vitiligo Community and others like us. Thank you! I have been a member of Vitfriends for 2 years. I appreciate having people who became friends, and who reach out to me with love and support. It?s important that we reach out and teach people who we are, as advocates for support. In times of stress and fear, I have a group of people who understands and give hope and encouragement. We need to stay unified and connect others to various groups for help. We are global and we are moving in to higher ground. God is directing us and creating a circle of people who will initiate change for the good of those who suffer with this disease. Doctors and researcher are on board to help us move closer to a cure and help for insurance. We must not get distracted, or become competitive. We are here by God's design and purpose. Those of us who hear the call will launch out into the deep out of our comfort zone to do this work. We are over-comers! The change I want to see must first begin in me. VITFriends goal is to expand our community, as we offer support as needed, when an interest is presented to us. Most of our groups are started by an individual who is passionate about awareness and wants to start a group in their local area. We are more than happy to offer guidance and support and a MENTOR leader. Visit us at our website, Twitter, and Instagram and learn more about our group. Best to you! This is the year of New Beginnings. Let us work toward the mark of the high calling of Christ Jesus and press forward. We have for two long oppressed ourselves. God came so that we could have life and to have it more abundantly. Why have we not taken hold of that promise? I say this is the year to finally hear what God is saying to you. Look not at the pass but look to your future. God wants us to be happy. If you believe that God loves you, then why won't you love yourself? Let’s all take the time out to love ourselves more than last year. Because God still loves us no matter what. I have VITILIGO! You ask me why do I look different? Did you ask why you look different? As people we are clearly not considerate of one another. We see someone that appears different. Do we think, no right away we come to our own understanding of what has happen. Oh that poor lady or man. The natural instinct is to stare, but do you stare until you have figured out what has happen to that person, or do we just take a glance and move on. YES, I for one stare and say Lord whatever has happen it is in your hands. I ride the subway daily and I can tell you that the stares are not from those who say Lord be with that person. As a person who is different, we must stand tall, be proud of who you are. Yes you say that is easier said then done. Oh yes it is hard. But, who can do it but you. You have been ordained to be apart of the chosen people. If we stand in one place for a long period of time and just look at all the different faces we see, can we really know what pain and suffering is going on in the minds and hearts of those we see ever day. But we show ours on the outside. But do we have to show pain or suffering? I say all this because we are the ones that have to make a difference in what we except for ourselves. No one person can change our feelings, but if we stand strong together we can help each other get from one day to the next. So if you promise yourself to take a good look in the mirror and LIKE what you see. You have just taken your first step to changing your own life. God is our creator, He can help you to make the picture more beautiful each day. We all have days when the mirror, your husband, your wife, and the list can goes on. The key is that only we can make it better for ourselves. Loving yourself is the only key to making our lives a success story. VALARIE: Pat, WELCOME and thank you for being a part of this work. So, how long have you had VIT? PAT: I have had Vitiligo for about 10 years now. It started on my elbows and just in the past couple of years it has bloomed. I say it has covered nearly 75% of my lovely body, if I may say so. VALARIE: How has it been dealing it VIT over the years? PAT: Dealing with Vitilgo can and I'm sure for must, be an ongoing feat. But if you know that there is a God that can help you weather the storms of life, you just go on. I tell most people just keep on keeping on. VALARIE: On your down days with VIT, What holds you together? PAT: Everyday is a new journey, but with out Jesus in my life I know that I could never have survived it . Most people have problems, not just Vitiligo, because this is just a part of life that I have to bear. But with out the Love of Jesus, I know that the days when i'm feeling down low. I can look up to the heavens where my help cometh from. Then things are just not that bad. I want to thank my lovely family that see's me for who I am and not for what I look like. I want everyone to remind themselves that there is always someone worst off then YOU. Keep pressing on. Phil. 3:14 I press on toward the goal to win the prize for which God has called me heavenward in Christ Jesus. Patricia Rossy - Remember God's Got It. Merriam-Webster's Online Dictionary - (1) characteristic of a person, group, or thing - DISTINCTIVE. (2) different from the usual or normal: SPECIAL, PARTICULAR, ODD, CURIOUS, ECCENTRIC, QUEER. Well we are, so what are we to do? While other people fight for what they believe to be special causes. Why then should we not do the same? Vitiligo is what we have! We are not contagious neither do we have Leprosy. It is our job as "Vits" to enlighten others of what we have. To stand tall and proud, we need to know about ourselves. When people are diagnosed with any type of sickness or disease they become equipped with all that is needed to sustain their way of life. Well we have many resources at our disposal. We are not in the dark ages anymore. As peculiar people with Vitiligo, we are not alone. So I say let us stand together one for another and keep each other informed. My experience is when you let people know about your Vitiligo it one way or another empowers you. Now you have educated one person who in turn now can pass that information on to others. You have taken a position and can now stand tall and proud. This weekend I had the pleasure of being in the company of our dear Valarie. She came to New York, to visit us. Valarie read her poem, THAT to the congregation at my church Bethel Gospel Assembly in Harlem. Before I go any further, if you have not read any of Valarie’s poems you are missing out on life changing words from a powerful woman of God. So since I said that you need to get her book or CD the Heart Speaks. But Sunday I really was able to feel it, and see that people could feel it as well as understand. See we all have a THAT. It is not only the ones with Vitiligo. But it is all of us. This THAT we hold on to, that keeps us from moving forward. These THAT’s that keep you back and these THAT’s that keep your head way down. Right now, let THAT that holds you back go, set it free. Only God and you can start the engine, learn you have earned the right to put your foot to the petal and begin to take flight. At this moment I see eagles flying higher then ever. Remember that Gods Got It. Featuring: JaHirah, Fierce & Fearless!